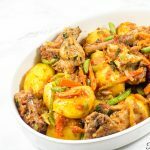 Welcome to the easiest dinner ever! 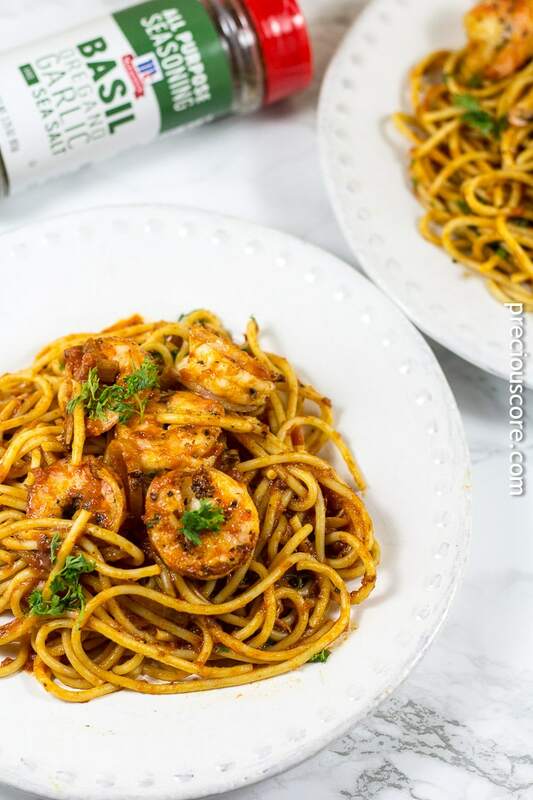 This blackened shrimp pasta is ready under 30 minutes and so full of flavor because we are leaving bland behind! You only need a handful of ingredients to make this quick and easy pasta dinner. Does anyone ever struggle with putting supper on the table? I know I do. 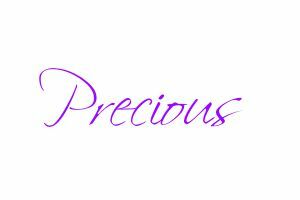 After homeschooling my kids each day I often feel so tired. The only thing I desire at that moment every late afternoon is sleep. But alas, there is dinner to be made! 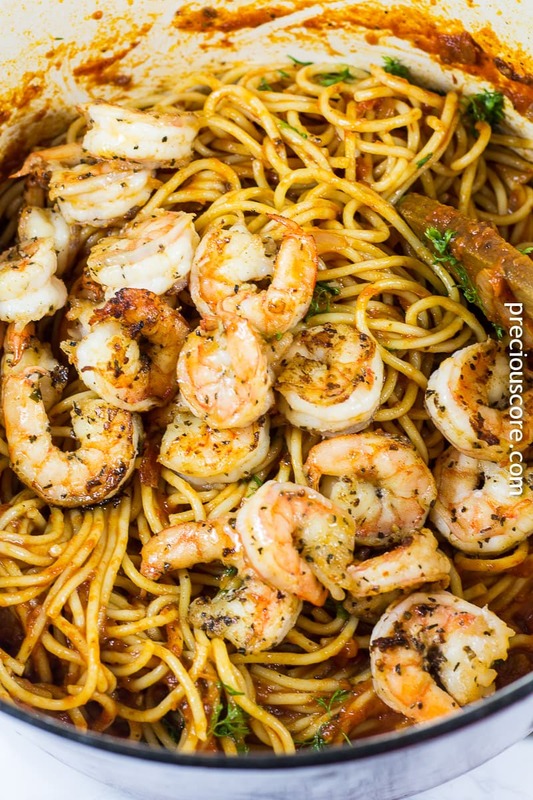 That’s why quick fixes like this blackened shrimp pasta inspired by my sweet friend Imma, are right up in my alley. 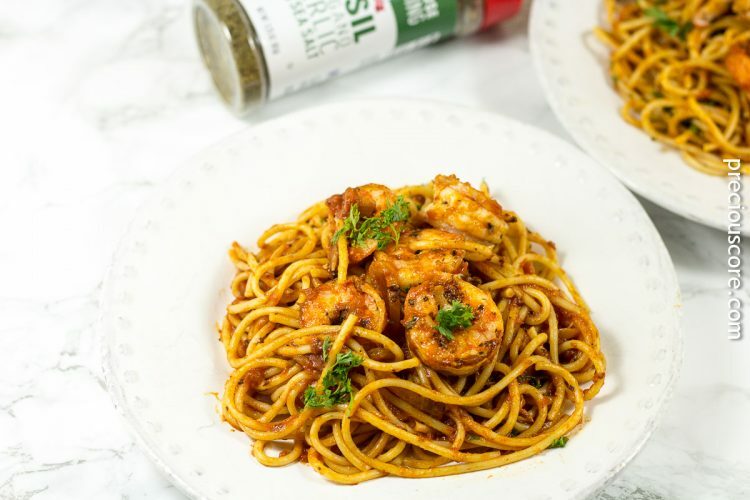 The pasta is tossed in a shrimpy tomato sauce that is garlicky and so good! What’s not to love? The ingredients are pretty minimal: pasta (I used spaghetti), shrimp, crushed tomatoes, onion, salt, black pepper and McCormick Basil, Oregano, Garlic & Sea Salt All Purpose Seasoning. All you need to do is boil pasta according to manufacturer’s instructions and set aside. Then season the shrimp with a good dose of McCormick Basil, Oregano, Garlic & Sea Salt All Purpose Seasoning. 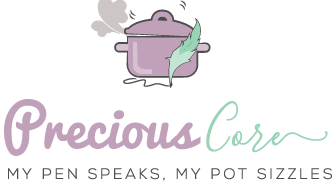 I really love the new McCormick All-Purpose seasoning blends because they make life easier in the kitchen. Normally seasoning blackened shrimp takes a combo of various spices but I find that the McCormick seasoning I used suffices. The New McCormick All-Purpose Seasoning Blends are a “secret weapon” that takes the guesswork out of flavor. 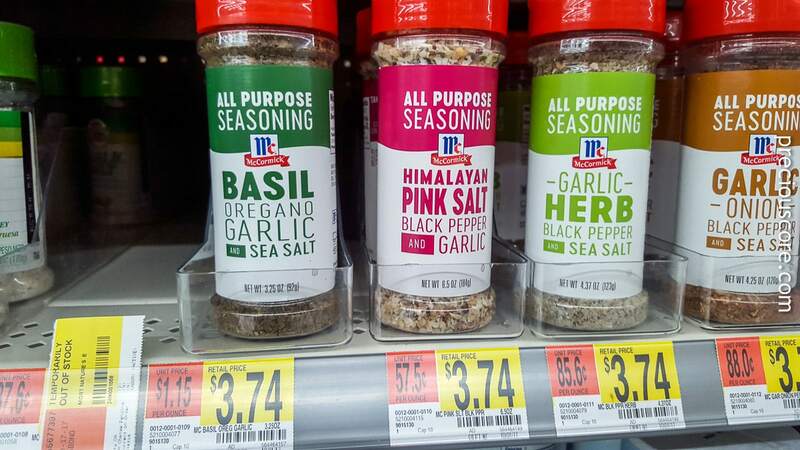 These seasoning blends are crafted with transparent ingredients. A great addition to any kitchen shelf. The next step is to heat up some butter and cook the shrimp on both sides. Now tell me why I do not want to stop at this point and eat all of this shrimp! 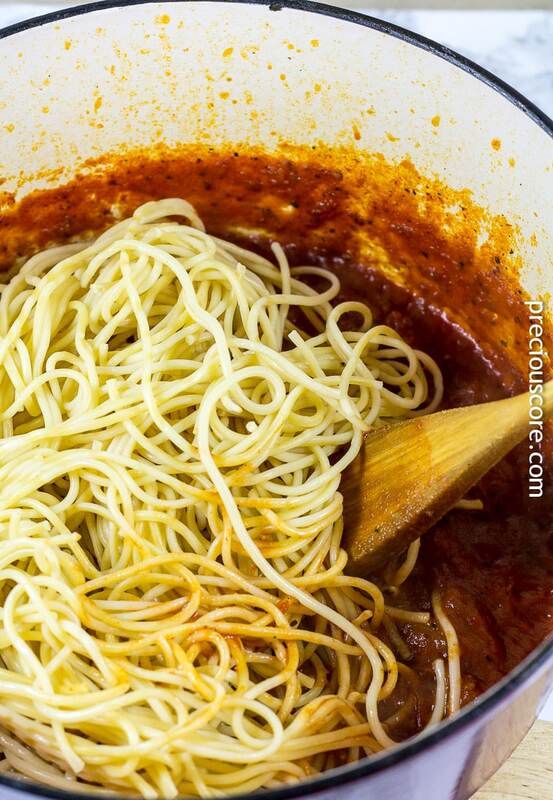 Then make a simple tomato sauce then throw in your boiled pasta. Toss well to coat the pasta then add in the shrimp. Believe it or not, dinner is ready just like that! 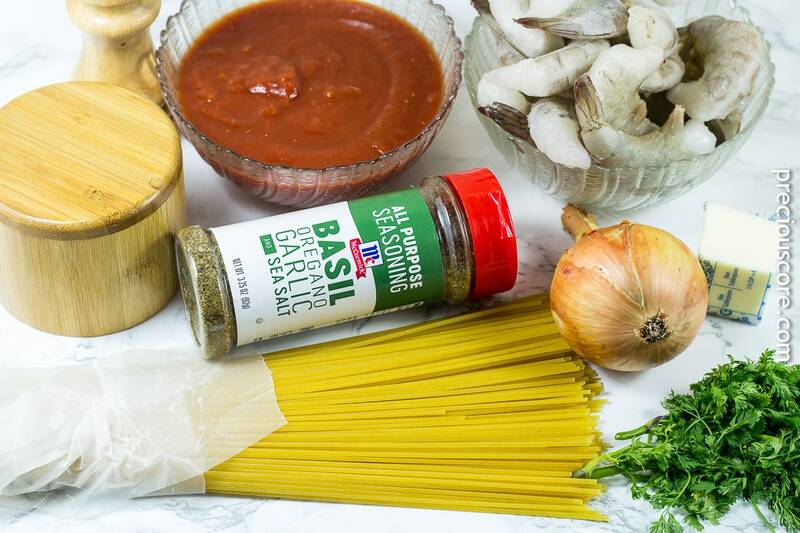 Thanks to McCormick, I can now enjoy a pasta meal with great flavor in no time! Update: I also used this seasoning to make sauce for homemade pizza and the flavors were spot on! 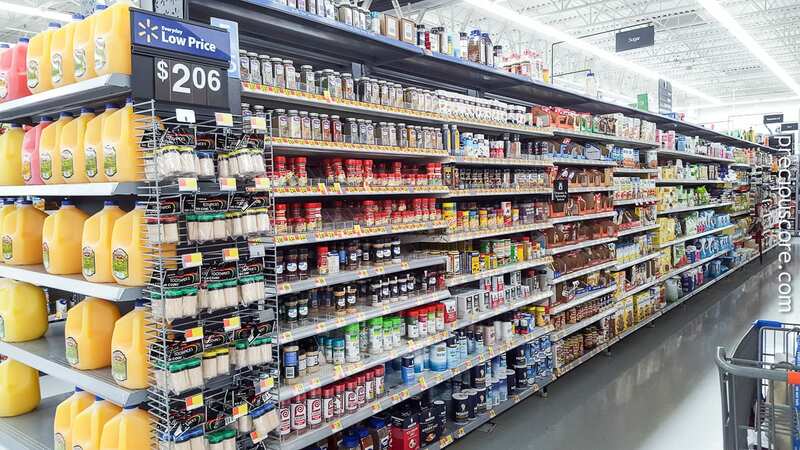 The NEW McCormick All-Purpose Seasoning Blends can be found at the spice aisle in your local Walmart. 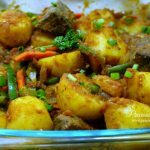 Hope you enjoy this simple dinner recipe. 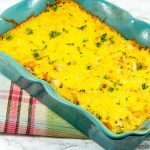 P.S Here is another one-pot pasta dinner you might love: One Pot Creamy Macaroni and Chicken (move over mac n cheese!). 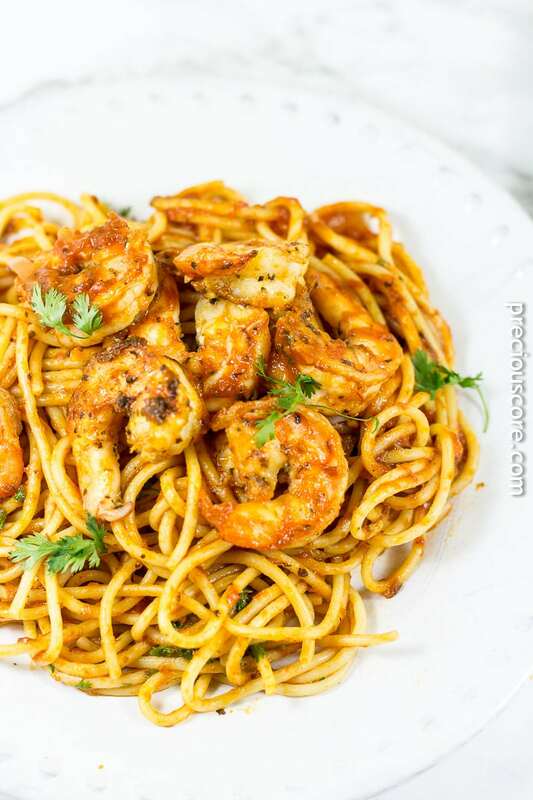 Blackened shrimp pasta - a flavorful pasta dinner made in 30 minutes. So easy, so delicious. Boil pasta according to package instructions. Drain and set aside. 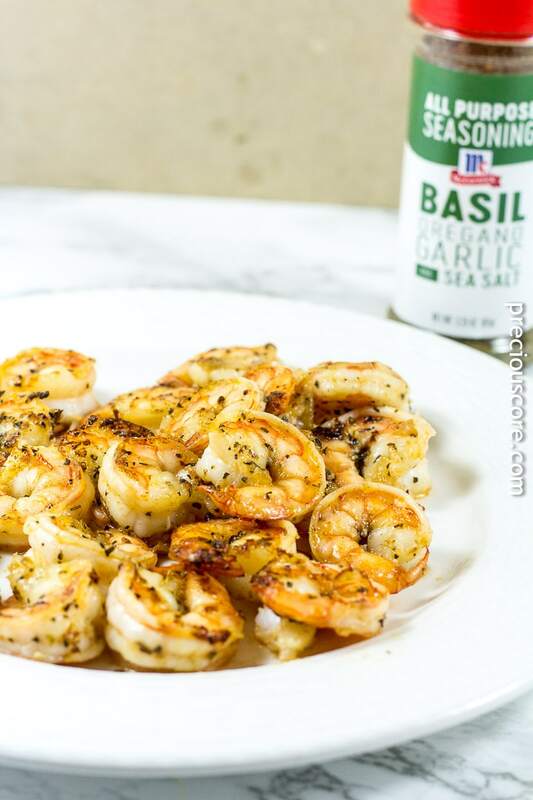 Put one teaspoon of McCormick Basil, Oregano, Garlic & Sea Salt All Purpose Seasoning over shrimp and mix well to coat. Place butter in a pot over medium heat. Once it melts, add in the shrimp and let them cook on each side for about 2 minutes. Remove shrimp when done - You know they are done when they curl and turn pink. Add the chopped onions to the butter to saute. Stir and let it cook until onions are fragrant. About 1-2 minutes. Add in crushed tomatoes and stir. Add a cup of water, salt, black pepper and half a teaspoon of McCormick Basil, Oregano, Garlic & Sea Salt All Purpose Seasoning. Let it simmer for 5-10 minutes until the water reduces. Add the boiled pasta and mix well to coat. Add in the shrimp and some freshly chopped parsley. Mix well and serve warm. 1. 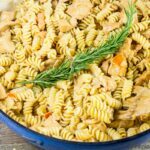 Any pasta of choice will work well in this recipe. I used spaghetti but you could use linguine, angel hair or just any pasta. 2. To make your meal extra flavorful, make a stock out of shrimp shells to use in the meal. Here is what to do: do not throw your shrimp shells after peeling. 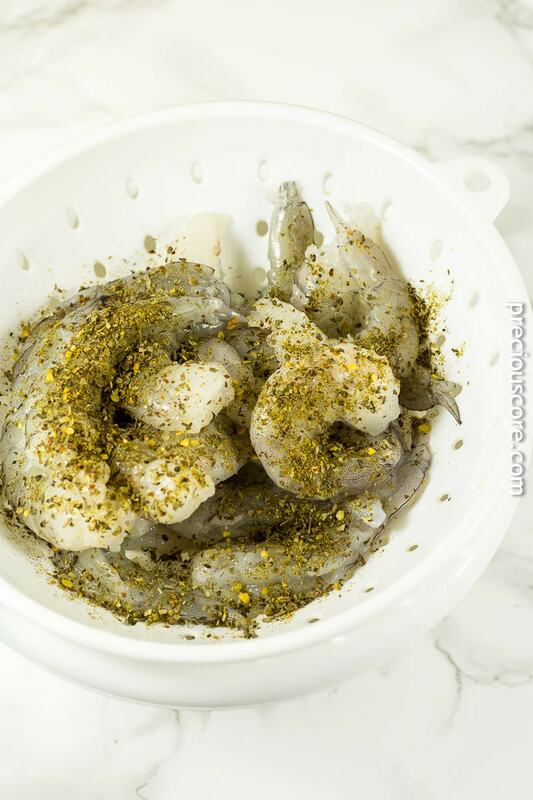 Instead, place them in a pot and add water to the same level as the shrimp shells. Then boil for about 5 minutes. Strain and use the stock instead of the required 1 cup of water in this recipe. 3. 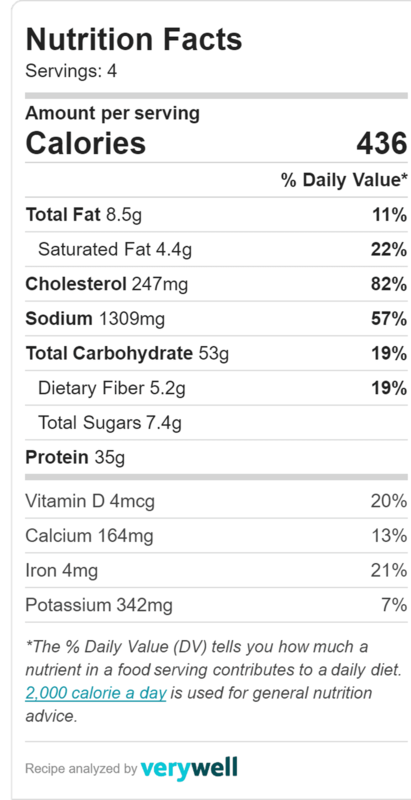 You could use white pepper (my preference) instead of black pepper. I just love the flavor of white pepper! 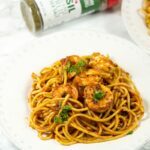 What a lovely recipe I enjoy shrimps and a good spaghetti this is a must try! The combo of shrimps and spaghetti is so good! Thanks Adriana! I definitely need to try out this recipe because the pasta doesn’t look soggy at all. I wish I could taste your food sometime. Next time I’m at Walmart, will look out for McCormick. Thanks for sharing. Thanks Zinny! I’ll check out the award. Looks really easy. 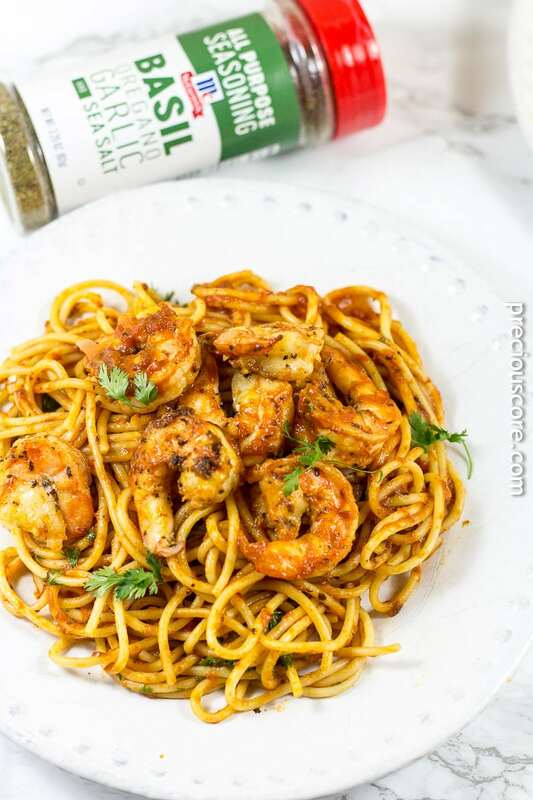 I love good seasoning and this combo with spaghetti and shrimps is hard to beat. You are right, dear. The combo of shrimp and spaghetti is SO GOOD. Spaghetti is my next alternative to noodles. It’s easy to make just like noodles. I will definitely be trying this recipe. Please let me know if you try it, dear. Enjoy!